The last two entries described how Jim and I gradually came to be traveling around the country for nine or ten months of the year, living in our 5th-wheel camper. Friends, people we meet along the way, and folks who read our web journals often ask us questions about this lifestyle and/or indicate an interest in doing some version of it themselves. This entry and the seven (yes, seven!) that follow are for readers of any age who have a serious case of wanderlust -- from those who dream about traveling around in an RV (recreational vehicle) for extended periods of time to those who want to sell their house, dispose of and/or store almost all of their belongings, and have even more freedom to roam in a little house on wheels. They are also for people who are just curious about "the RV lifestyle." Maybe it will plant a seed in someone's mind that will later germinate into, "Gee, that sounds like something I'd enjoy! Let's give it a go." As you'll see, there isn't just one way to enjoy this lifestyle but many variations on the theme. Maybe one of them is right for you someday -- or now. WHO TRAVELS & LIVES IN AN RV ALL OR MOST OF THE TIME? All kinds of people -- male, female, older, younger, richer, poorer, retired, still working . . . There is no one "type" of people who gravitate to this lifestyle, and there are many versions of it. 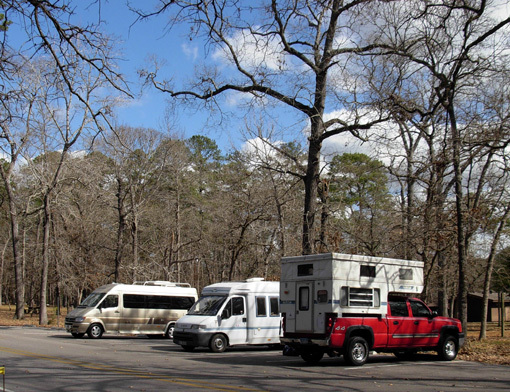 Two Class A motorhomes at Balmorhea State Park in Texas, a pleasant place to camp in January. Even though Jim and I have vacationed and traveled to races for short periods of time in an RV for four decades, we weren't completely aware until a few years ago that there are well over a million people in the United States who live in their RVs for months or years at a time -- deliberately, for the fun of it, not because it's all they can afford. Just how many people live like this is hard to pin down because people transition in and out of the lifestyle and ten-year census figures just don't capture what's happening. The 2010 census was supposed to reflect who was living where on April 1. How was someone supposed to find us in a campground in Georgia on that date? We ended up calling the national census number and giving our information over the phone but I'd bet a lot of RVers weren't even counted unless they initiated a phone call like we did. I can't remember if there was even a category for full-time RVers. There certainly isn't one for the way Jim and I travel and live. The person I talked to was pretty confused about our lifestyle! 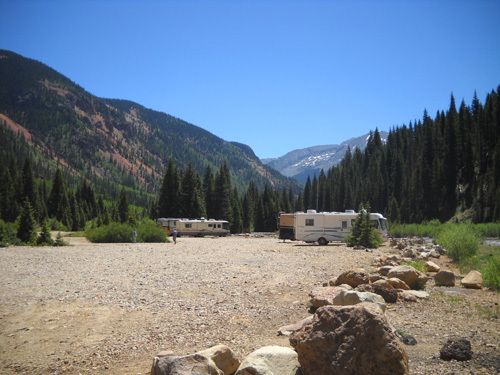 Some RVers still own a piece of dirt** (any type of living quarters that is stationary) that they call home and venture forth for long periods of time in their camper. I call this extended-travel in an RV; it's what Jim and I do, although we don't consider our house to be our home. Our camper is our home, the place where we live 9-10 months of the year. I described our version of this lifestyle in the last two entries. Other folks have bravely "sold their dirt," sold/given away/stored their possessions, and headed off into the wild blue yonder in their RV. They are full-timers. They are not homeless; their house on wheels is their home. It's a rolling residence that moves around the country, giving them a measure of freedom unknown to the rest of us. Some people love full-timing so much they've been roaming around in RVs for decades. At the other extreme are folks who quickly find out that type of life is not for them, and they resume living most or all of the time in permanent housing. Most full-timers are somewhere in between, spending several years on the road until they tire of it or something (often it's medical problems) compels them to re-settle in one area. Even when Jim and I sell our current house we'll probably get another house, condo, or apartment at some point in the future when we get tired of traveling all the time, have medical issues that prevent it (like the knee or hip replacements I'll eventually need), and/or something else changes our minds about living in our RV. Life is full of transitions and we'll adapt as needed. Meanwhile, it's a lifestyle we love. 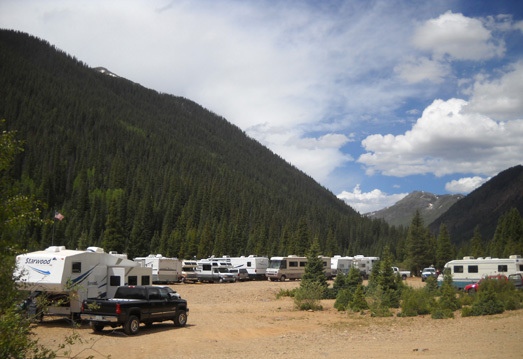 Late June, 2010: same campground, different view -- starting to get crowded before the holiday. The majority of full-time and extended-travel RVers are retirees but an increasing number of younger couples and singles are finding ways to earn an income while they're traveling around the country. Electronic advances and the internet make this easier on everyone, whether Grandma just wants to keep in touch with her grandchildren via e-mail, a young Baby Boomer ditches the corporate rat race to write travel articles for a living, or a Gen-Y'er wants to develop a career building websites. Any of them can do these things from anywhere in the country -- or world, for that matter. Why not do it in a comfortable RV and be able to move around at will, following your muse? WHAT MOTIVATES PEOPLE TO DO THIS? They want to see as much of our country/continent as possible before they're unable for some reason to do it. It's a wonderful chance to see as many of the national parks as possible, for example, to visit cities and states you've never seen, to retrace historic old roads like Route 66, to run races or attend sporting events all over the country, to follow birding trails or spring wildflowers, to visit friends and relatives strung from one coast to the other -- whatever you've always wanted to do but didn't have the time to do previously. They seek a simpler lifestyle with less stress, less "stuff," and more time to pursue personal growth instead of being beholden to a house, yard, community, and other commitments. Sometimes we get so wrapped up in accumulating things that we don't accumulate experiences. Or we're so busy working or raising families or serving on committees that we lose sight of what makes us unique individuals. There are few demands on your time and energy when you leave all or most of those obligations behind. Every day can be yours to fill with activities that bring you the most enjoyment. Is that selfish? Some people think so. I think it's a great way to maintain one's sanity in this hectic, wacky world. You can be as active or relaxed as you want when you're roaming around the country in a camper. Jim and I have joked since retiring that "everyday is Saturday." It's even more true with an RV lifestyle. 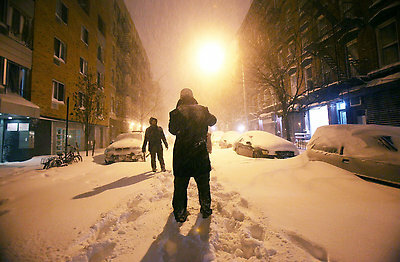 They are "snowbirds," spending the winter months in warm Sunbelt states while most folks are shivering, shoveling snow, and sliding around on icy roads in colder places (this winter even Florida has had its share of sub-freezing weather, however). Jim and I usually head for southern Arizona and Texas in the winter. I guess we qualify as "Winter Texans" because we're there most of January, February, and March. In the summer, when the southern tier states get uncomfortably hot, the snowbirds tend to flock back north or go to higher elevations where it's cooler. (Which is why we see so many Texas tags in Silverton, CO, elev. 9,000 feet, in mid-summer.) That's our MO, too. 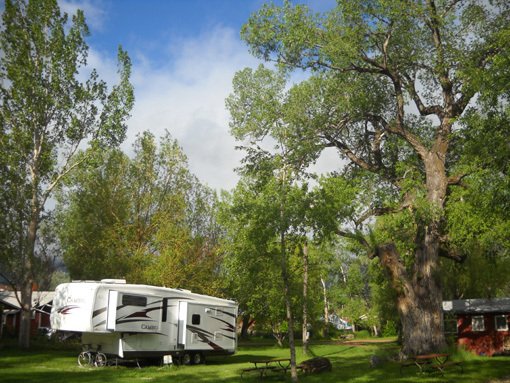 We choose campgrounds in the high Rockies from New Mexico to Idaho or Montana between May and October. We live in what I call the "Dandelion Time Warp" because the temperatures are spring-like and we see dandelions everywhere we go from January to December. They have a job that requires frequent travel and they don't want to stay in a motel every night -- traveling nurses, teachers, speakers, salesmen, construction workers, consultants, entertainers, etc. Having their own comfortable home on wheels makes a lot of sense. They want the freedom to roam while still earning a living doing some type of rewarding work like writing, photography, even leading RV caravans to special places like Alaska -- things that can be done from their RV instead of a cube farm. View from my computer desk in the Cameo: would you rather work here in January . . .
CAN YOU GIVE ME SOME EXAMPLES OF DIFFERENT RV LIFESTYLES? Sure. 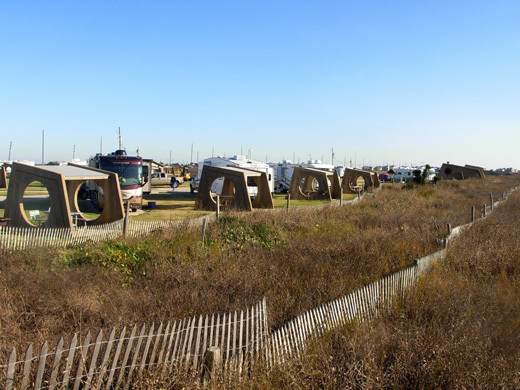 There are many variations depending on the types of RVs people have, how much they travel around in them, where they park/camp, and how they spend their time. There are two basic RV lifestyle categories I'm talking about here -- folks like us who travel and live most of the time in an RV but who still have a "stick" house, condo, mobile home, apartment, or other stationary place they own or rent, and those who travel and live full-time in their RV with no stationary abode. I'm not talking about people who buy an RV and live full-time in it on a lot, similar to folks in mobile home parks, and never travel around in it. It's fine if they want to live in one place all the time but that's not the lifestyle I'm describing here. This series of entries is about folks who travel in their campers. That doesn't mean they're constantly on the road, however. There are many variations in regards to mobility. Jim and I probably move around more than most retirees because 1) we're usually following races we want to run and 2) many of the public campgrounds where we prefer to stay have two-week limits. The longest we've ever stayed in one spot was three months and that was not a place we really enjoyed. It was the only place available in late winter/early spring when we bought our house near Roanoke and we had to wait to move into it. Otherwise, I think the longest we've ever camped in one spot so far is a month. We usually stay at destination campgrounds for one to three weeks, then move on to the area where our next race is located so we can train on the course. We often stay for one or more days at an interim location to see something new, revisit a favorite place, or visit with someone on our way to the next race venue. Some RVers move even more than we do, for whatever reasons. They may have the goal of visiting all 50 states (or at least 49 of 'em!) and Canadian provinces in a certain period of time, or they're following migrating birds so they can add to their lifetime bird count. Maybe they just get bored in one place and like to move around. 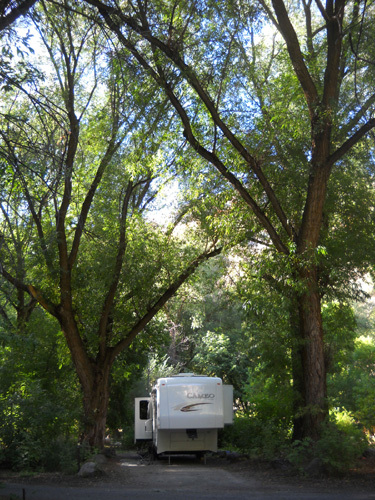 The Cameo is dwarfed by huge trees at Guinavah CG near Logan, UT. At the other extreme are RVers who stay put for months at a time. 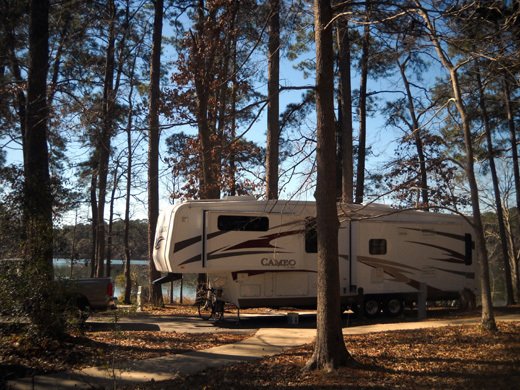 Some purchase RV lots with storage units and use it as their home base in either the summer or winter. 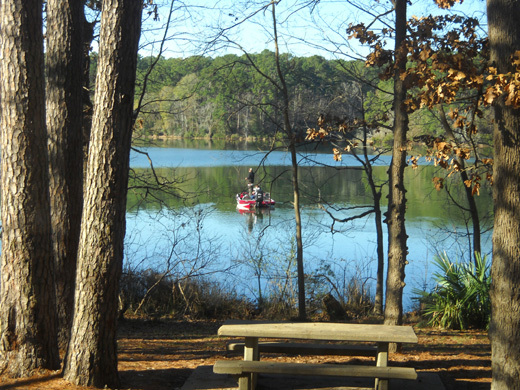 Others find good seasonal rates in various campgrounds. 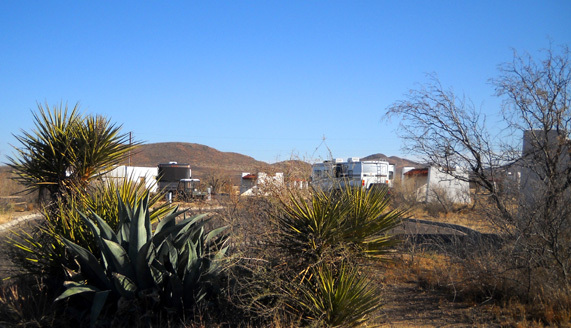 It's common for snowbirds to spend the entire winter at a private RV park in Florida, for example, or boondock in one place like the long-term BLM areas in Quartzite, Arizona. Then they move on to cooler climes when those places heat up in the spring. Other people who remain in one place for longer periods of time include campground hosts, folks who are still employed part time, retirees who want to be near their grandkids all summer, and people receiving long-term medical treatment. Those are just a few examples. Moving around a lot can be more expensive than staying put for a longer period of time because of the fuel costs. 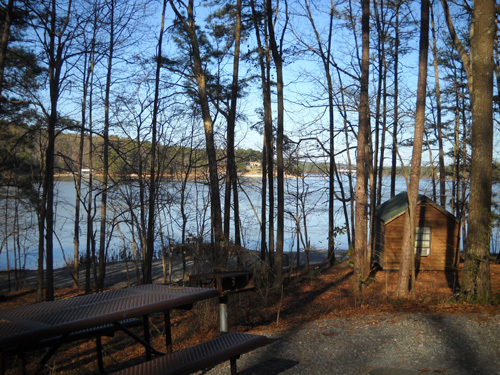 On the other hand, moving from one free or inexpensive campground to another in the same general area every two weeks can be cheaper than spending several months at a more costly private campground. 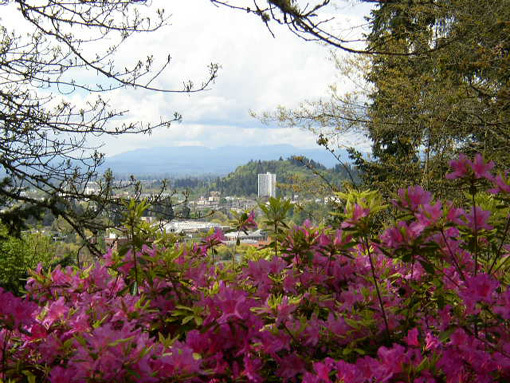 Portland, OR is beautiful in the spring but we haven't been there since 2003. There are places Jim and I would love to visit if they were closer and didn't require so much diesel fuel. We are itching to go to Alaska for an entire summer, for example, but so far we have ruled it out in part because of the huge cost to get there. 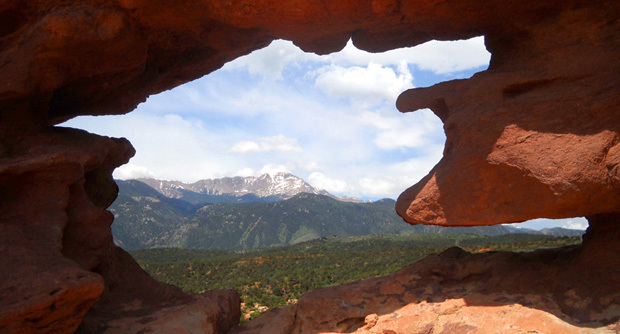 It's expensive enough for us to travel back and forth between Virginia and Rockies/Southwest twice a year. Alaska is a trip we'll probably postpone until we sell the house, are full-timing in our RV, and can spend more time in northwestern U.S. and Canada to make it more cost-effective. There are other variables involved when you're describing RV lifestyles besides how often people move from one place to another -- different motives for traveling in the first place, different types of RVs they drive, different kinds of campgrounds and other places to park, different ways of spending time and money on food, activities, and hobbies . . . There are as many different RV lifestyles as there are people who travel and live in RVs. You just start out doing what you think you'll enjoy and your budget, interests, and experiences will dictate how that morphs over time! It's been a gradual process for us and I'm guessing it is for most RVers. You learn a lot as you go -- as much about yourself, possibly, as the places you visit. The RVs of three of our ultra running friends who ran the 2009 Rocky Raccoon 100-miler. All of them travel in their campers either extensively or full-time. Some of the RVers we know are ultra runners like us who frequently travel in their RVs to races and great places to train. Some own houses, some full-time in their camper. They travel in everything from little truck campers to big ole Class A rigs. Some camp for free at trailheads, on forest service land, or in urban parking lots every night. At the other extreme are the ones who prefer luxury RV resorts. Some eat out most of the time, rarely using their RV refrigerator or stove. Some prepare gourmet meals in their RVs. Some are loners. Some need constant social stimulation. People who follow NASCAR races, golf tournaments, and other sports events around the country are similar to -- or should I say, just as widely varied as -- our ultra running friends. So are the folks who want to visit all the states or national parks, follow an historic route like the Oregon Trail or Route 66, visit the quirkiest museums they can find, tee up at the finest golf courses, hunt for rocks and gems, geocache in new venues, photograph old Spanish Missions, climb the high points in every state, drive the length of scenic byways like the Blue Ridge Parkway, visit Civil War battlefields and re-enactments, attend RV rallies, add to lifetime bird counts, go to NASCAR races or quilt shows or minor league baseball games or hot air balloon shows or scrap-booking conventions or antique auto shows or model airplane fly-ins all over the country . 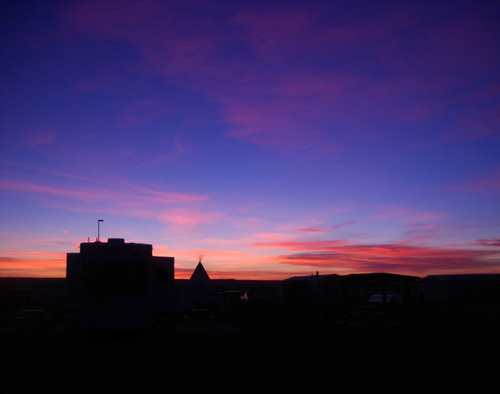 . .
You can combine an RV lifestyle with almost any interest you have. Be creative and add to your bucket list. RVers can be as active or sedentary as they want. Jim and I enjoy a wide variety of activities when we're traveling/living in our RV. We exercise almost every day by running, hiking, walking, cycling, working out at a local YMCA, or doing yoga. We visit museums and historical places that interest us. We walk around the campground and talk with other campers. 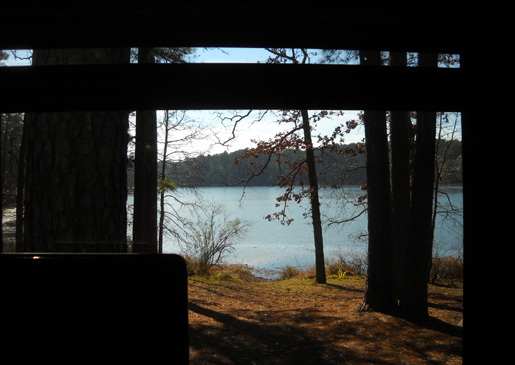 We sit outside or gaze out the windows to absorb the peace of the mountains, water, or forest within our view. There's always something to do, or absolutely nothing at all. That's the beauty of the RV lifestyle -- you can make it anything you want. Next topic in this series: personality and people issues -- who is most likely to enjoy this lifestyle? how can two people live in harmony in a little home on wheels 24/7?